Christmas is over, or so it would seem. The stores have had their after-Christmas sales, the unwanted gifts have been returned, and we’re getting set to take down the tree and its accoutrements. Indeed, it’s time to replace the Christmas “stuff” with the Valentine’s Day “stuff” on our store shelves. That is one way of telling the story, but if we want to tell it liturgically, then Christmas is still with us, and will remain with us until the day of Epiphany (January 6). We may have grown weary of the Christmas music by the time that Christmas Day arrived – that’s because the radio stations and the stores start playing it earlier and earlier each year – but there is still time to sing the carols that declare our praise to God that Emmanuel is with us. Now, some of us try to limit the church’s exposure to carols, so that we’re not ready to move on by Christmas Eve, but the pressure is strong to do otherwise. Advent hymns simply don’t have the same cachet as the Christmas carols, which are ringing out in every corner of the land (except perhaps in church). As we near New Year’s Day, which this year falls on a Sunday, we still have the opportunity to reflect on the meaning of the incarnation – that God would visit the creation in the form of a child born in a manger. Even if some have had their fill of the music of the season, the songs of Christmas continue to invite us to join with the angelic choirs in singing Glory to God in the Highest. But with every message of joy and thanksgiving comes that dark cloud that reminds us that not all is well in the land. Christmas is a time of joy, but we dare not give room to naiveté. Remember the story that Matthew tells about the slaughter of the innocents. 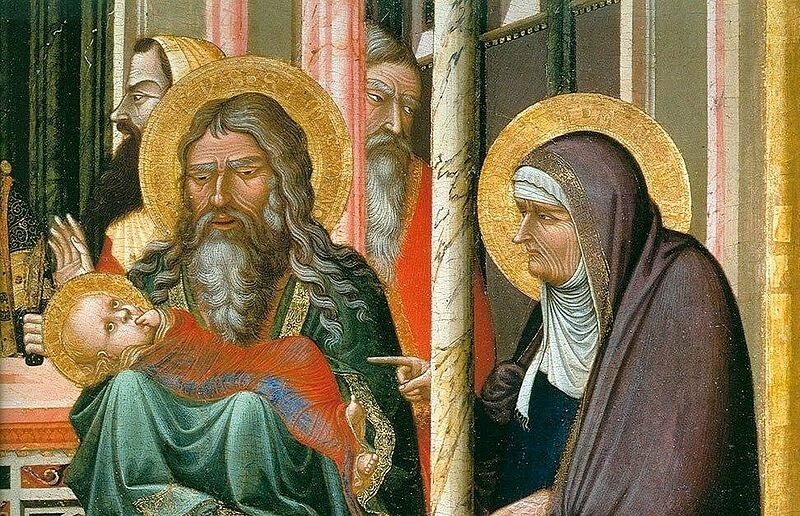 As we’ll note in a moment, even as Simeon offers a song of joy, he warns Mary about the dangers ahead. In spite of the glitz that attends the season, the Christmas message itself is rather earthy. It is a reminder that God takes the material world seriously, for in the words of the Gospel of John, “God so loved the world that he gave his only Son, so that everyone who believes in him won’t perish, but will have eternal life” (Jn. 3:16 CEB). Although this well-worn text from John is not the focus of our attention this First Sunday after Christmas, it is representative of the message present in these lectionary text that stand before us. The word is this: God is present, bringing into our midst redemption and salvation. That message, of course, is deeper and broader than is often presented. Salvation is more than simply rescuing the perishing from this present world, a message that has more in common with Gnosticism than with the message of Jesus or the prophets, who are concerned not just with the heavenly, but also with the earthly (consider the Lord’s Prayer). The continuing Christmas message is centered in this reading from the Gospel of Luke, where Mary and Joseph take their child to the Temple in Jerusalem, to offer sacrifices and dedicate him to God, as the Law commands. We will assume that they ultimately did this, but Luke’s storyline gets interrupted by two witnesses to the importance of this birth. Two elderly persons, both devout and faithful, have been waiting for the revealing of God’s messiah their entire lives. They waited patiently for the revealing of the one who would redeem/restore Israel, and their waiting proved providential, for on this day of days, they encounter a young family in the Temple precincts, and on that day their hopes and dreams are fulfilled. Simeon offers a word of thanksgiving that God has prepared a savior for Israel, but also a light to the Gentiles. It is a word of reminder that the while Jesus emerges from Judaism, according to Luke the ultimate vision goes far beyond the boundaries of Israel. It is a reminder too that God’s people includes Israel, but is not limited to Israel. Such joy is to be shared, except that Simeon also sees a dark side of this revelation. This child, who is an expression of God’s glory, will also generate opposition, and be the cause of much dissension in Israel, even as he reveals the inner thoughts of those around him. Thus, Mary will experience a piercing of her innermost being. 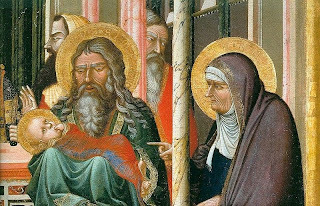 There is, it would seem, always a mixture of joy and sadness in life – even the life of the one whom Simeon hails as God’s messiah. Simeon’s is not the only voice to be heard, for Anna, a prophet of the tribe of Asher, who adds her voice to this offering of praise and thanksgiving. Luke says that she told everyone who was looking forward to the redemption of the Jews, that the awaited one had arrived. With this witness in mind, the family returns to Nazareth, their home, where according to Luke Jesus grows up, becoming strong and wise, and experiencing God’s favor. We hear nothing about miraculous powers – no clay birds flying – just a word about a child who grows, matures, and reveals God’s presence in the world. Paul doesn’t share any details as to the nature of Jesus’ birth or how he happened to grow up in Nazareth, for Paul shows no real interest in such details, but he too finds joy and purpose in Jesus’ arrival in the world. He speaks of the “fulfillment of time”; that is, at just the right time, when God sent the son, “born of a woman, born under the Law.” In my reading of this, I hear a word about the scandal of particularity. This is not an abstraction; it is a story of one who has a human birth that takes place in a particular context – a Jewish one. There are those who might want to make something of the reference to Jesus being of a woman, as if this is a statement about a virgin birth/conception, but that would, in my mind, be reading too much into this passage. What we do hear is that in being born under the Law Jesus redeems those under the Law, perhaps by fulfilling the Law. As a result, Jesus, being culmination of the Abrahamic and Mosaic callings, becomes the bridge across which those outside the Law (Gentiles) might enter into God’s family – by adoption, of course. Paul contrasts the former estate of his readers – they (Gentiles) had been born slaves, but now they children of God – sons and daughters, into whom the Spirit of God’s Son now resides, enabling them to cry out “Abba Father!” This usage is important, because it’s almost a doubling down – the use of the Aramaic for father and the Greek. Whatever one’s former background, one now is a son and daughter, an heir of God. It is good to remember the laws of inheritance. This word is given in the context of a challenge to the right of these Gentiles to claim God’s inheritance. Paul is responding to Jewish Christians who are demanding that these new believers first receive circumcision before being granted full citizenship in God’s family. Paul treasures his Jewish inheritance, but he doesn’t believe that circumcision is a necessary step for Gentiles. Jesus has done what is necessary to end their slavery, and bring them not just to freedom, but into the family. The word of the prophet Isaiah (the third prophet of that tradition) rings out into the ears of a post-exilic people. They’ve returned home from Babylon. They are free, but as they look around they see a scene that has dampened their enthusiasm. Jerusalem is in ruins, as is the Temple. But the prophet calls on the people to rejoice in the Lord, even in a difficult situation, surrounded by ruins, with memories of what once was (we who live in metro-Detroit know something of this feeling – yes, even a newcomer like me has caught on to this reality). Rejoice, the prophet calls out because God clothed him in victory, wrapped him in a robe of righteousness, so that he is dressed as a bridegroom wearing a priestly crown and a bride adorned with jewelry. Where some see signs of despair, the prophet sees God at work. Yes, even as the earth offers up growth, so God grows the righteousness of this people, so that praise of God might be offered before the nations. Salvation is at hand. Soon the world will look at you and see your righteousness and your glory. You will have a new name, one that the Lord determines, and you will be a splendid garland in the hand of the Lord, and a royal turban in God’s palm. The world may see only ruin, but given time, God will bring this land back to life. So rejoice, because God is at work. We could take this in a very passive way, and sit back and wait for God to finish the job, but even as the prophet speaks of God’s work, there is in the biblical story a reminder that God’s people are the means by which this work is accomplished. We are partners in this work of God, this work of redemption, for we are, as Paul reminds us, joint heirs with the Son.